Our Fort Lauderdale half day fishing charters are 4 hours long and leave from our docks in Fort Lauderdale. Our Fort Lauderdale half day fishing charter is a great option for anglers who want to get out on the water and catch a lot of fish, but have a limited amount of time or a limited budget. One great thing about our Fort Lauderdale charters is that our boats are located very to close to the inlet and Fort Lauderdale and we have very good fishing close to shore. That means that even on one of our four hour fishing charters, you'll have plenty of time to catch fish since we don't have to travel very far. Our half day charters include all the fishing equipment you'll need, a mate, a captain, the boat and fuel. We also supply a cooler with ice and you are welcome to bring your own food or drinks aboard. We can also arrange catering on your trip and have food and drink waiting for you. On one of our half day charters, you'll have the chance to catch the big fish that our full day charters catch. Depending on the time of year, you could catch a monster fish like a swordfish, sailfish, or shark. 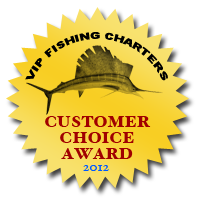 We often catch some of Fort Lauderdale's favorite fish to eat, like wahoo, tuna, and mahi mahi. If you catch something edible on one of our half day charters, we'll immediately put it on ice. When we get back to the dock, we'll clean and filet the fish for you and package it in zip lock bags so you can take it home with you. Our Fort Lauderdale fishing captains are experts at cooking fish as well and can recommend different ways to prepare your fish. Alternatively, we can recommend some great Fort Lauderdale seafood restaurants that you can bring your fish to and they'll cook it for you. This saves you money on dinner and the hassle of cooking. It's also very fun to know that you're eating the fish you caught yourself!